How rabbit meat and duck liver made Santé the most controversial restaurant in town. 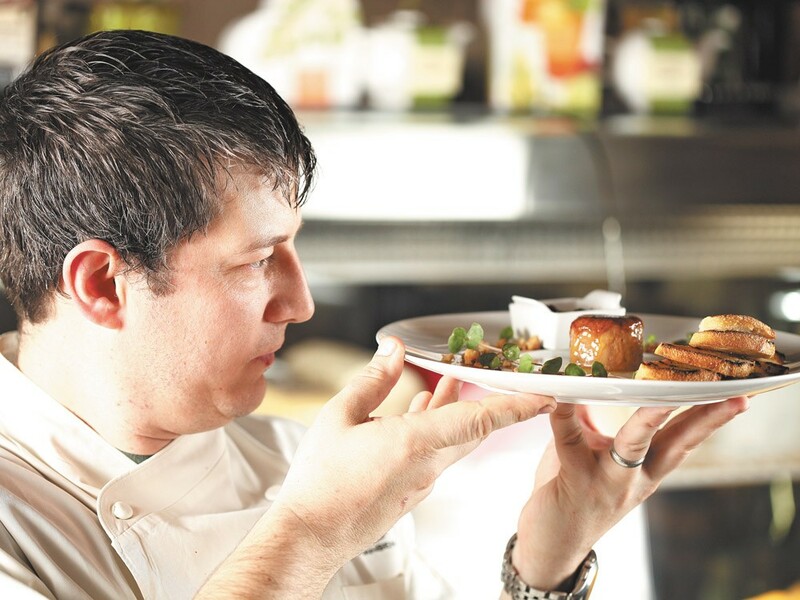 Sante Chef Jeremy Hansen with his foie gras brule. Jeremy Hansen is in tears. Moments before, the chef-owner of Santé — a popular downtown Spokane French restaurant and charcuterie — sat rigid at the front of his restaurant, arms crossed across the chest of his starched-white chef’s jacket. He looked worried. Hansen — alongside a beef farmer, a culinary instructor and a farmers market manager — was sitting on a panel at a town hall-style meeting to discuss ethical eating practices. After each panelist gave his or her opening remarks, it was Hansen’s turn. As he explained the philosophy behind his restaurant — to have relationships with farmers, to understand the lives of the animals that will one day be on plates here, to never waste a bone or stem — Hansen started choking up. “It’s hard for me to talk about sometimes because … it means a lot to me,” he says. Over the past few weeks, Hansen found himself in the hot seat of an online debate over the ethics of the food Santé serves. Arguments largely focused on the appearance of foie gras and rabbit on the restaurant’s menu. Hansen says online comments even escalated to death threats. And so he organized last week’s forum to mediate the situation in person. Hansen says the flap started after an article in Spokane Coeur d’Alene Living discussed a rabbit killed at Santé for a class on butchering the animal. “It was a gem of a PETA (People for the Ethical Treatment of Animals) story as the bunny went limp under the female author’s avocado green Birkenstock,” the article read. Since opening four years ago, Hansen has been vocal about Santé’s practice of whole-beast cooking. Unlike most chefs, Hansen purchases whole animals — head, feet and all — and prides himself on using every bit of the animal in his dishes. So, when Novella Carpenter, author of Farm City: The Education of an Urban Farmer, stopped in Spokane, it was a natural fit to host a class on cooking rabbit at Hansen’s restaurant. For the class, Hansen ordered whole rabbit carcasses for Carpenter to demonstrate butchering techniques. But on the morning of the event, the rabbits showed up already broken down into neat, ready-to-cook cuts of meat. And that’s when Hansen decided to go pick up a rabbit from Northwest Seed and Pet — a “garden and pet store” that often has rabbits for sale. The animal was brought back to Santé where, according to Hansen, Carpenter killed it. “It was very quick, very easy,” he says. “The rabbit didn’t make a noise and all of a sudden it was on the table ready to break down. “It’s not fiction. They had to get a rabbit, they had to kill it on the spot,” Haeder says. “It was a funny story and it’s not fiction.” Hansen continues to contest the account written by Haeder (who formerly contributed to The Inlander). Regardless, people like Tracy Martin — who runs Rabbitron, a local rabbit rescue organization — weren’t amused. She expressed her horror on Santé’s Facebook page, and encouraged other local animal advocates to speak out to Hansen. Soon, Martin saw her passionate argument against rabbit served on Santé’s menu spin out of control and change direction. To get foie gras, producers have to restrain the duck, insert a 6- to 10inch tube (often called a “crammer”) down the esophagus of the animal, then scoop nearly one pound of food into the tube. The process takes up to 15 seconds, and happens three times a day. That process of force-feeding is where foie gras gets controversial, and the reason why the product is banned in Israel, Turkey and, as of this year, the state of California. But, it’s a taste that has captivated chefs. In a recent This American Life episode, “Poultry Slam,” one chef described the allure of foie gras. At the forum, Hansen is unfazed as he defends serving foie gras. “In the natural habitat, I think, for all animals or birds, they probably would just eat as much as they possibly could if they had a chance to,” he says. “That’s just in their genes to keep eating and eating and eating. … It’s a natural process either way.” Hermes says that’s flat-out wrong. “Birds eat to satisfy their energy requirement. Unlike us, we want to feel full … [but] birds, if you’re feeding them a high-calorie diet, they will tend to eat less,” he says. “That’s why under normal conditions, they don’t get obese. We’re eating for a different reason. Animals don’t do that. Hansen says he wouldn’t take an item off his menu because of controversy. But despite the fact that foie gras isn’t new to his menu and has been served at other Spokane restaurants, he’s rethinking its place on the Santé menu. He prides himself on getting 70 percent of his goods from local sources. His foie gras source — one of just two in the U.S. — is located in New York.